Celebrate making the choice of organic! Ten reasons to be happy! You are helping keep small farms and farming communities alive – this is important for the stewardship of the land – all our futures depends on it! I know its not easy and it’s more expensive to choose organic but that is because it is the real cost – the non-organic includes ‘externalised’ costs (article to follow) someone else has to pay (poisoned water, cancer…) plus organic farms have to pay to be certified (the polluters should have to pay). 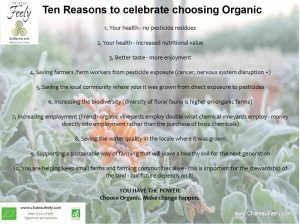 Celebrate choosing organic! You are doing so much good! 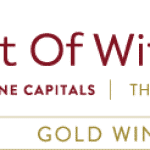 See our series on why organic starting with these basics in more detail and how to tell if a wine is organic or not. 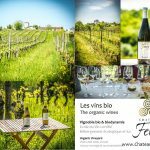 Come and learn more about organic farming with a visit to Chateau Feely in South West France ; stay with us or do a multi day course or multi day tour . You can read about the story of our organic farm the series includes three books Grape Expectations; Saving our Skins and Glass Half Full by Caro Feely. You can order them from your local bookstore or online. Grape Expections is also available as an English Audio book and in Polish as printed ‘Winnica Marzen’.